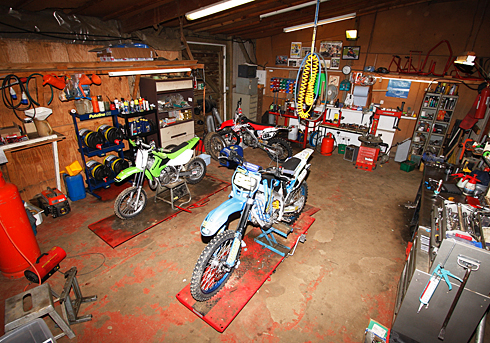 In our workshop we offer servicing and rebuilds on all makes of bikes, two and four stroke. Our machine shop is equipped with a lathe and mill, plus other equipment enabling us to carry out engine tuning, such as cylinder porting, and head, carburettor and crank case modifications. We have recently installed state of the art DYNO testing equipment. Suspension: Seal replacement, full shock rebuilds, nitrogen recharging and full competition modifications. Ignition Systems: We supply and fit Vortex reprogrammable ignitions. We have all the software needed to set these up to any specification required. Available for Honda, Suzuki, Kawasaki, Yamaha and KTM. Wheels: Full rebuilds, respoking and tyre fitting. Spares: We stock spares such as: piston kits, piston rings con rod kits, bearing gaskets, seals,chains, sprockets, levers, brake pads, oils, handle bars/grips, spark plugs, plastics, air filters, bike stands, tools, plus much, much more. Tyres: Dunlop, Pirelli, Michelin, Bridgestone, Maxxis and Barum. Extras: We also keep a full range of bolt on tuning accessories including VHM heads and V Force reed blocks.